I had a recent discussion with a client regarding management of VMware Licenses after an ELA. This is a area that I’ve been actively working on since the launch of My VMware and thought others would benefit from my high level summary; the following applies to both an Unlimited or Capped ELA. This advice assumes a bit of license key management up front but very little compliance management over time. Over the years I have seen too many larger enterprises pay the price (literally via audits) for poor license key management from too many large enterprise software vendors, hence my invest bit now to save a lot later approach. More details can be found under my other My VMware posts. Please keep in mind that when my clients or I work with the portal, we’re usually dealing with literally hundreds of different licenses, order, contracts, and historic support requests that are spread across multiple divisions and business units of Fortune 100 enterprises. As a result, many of these gotcha’s may not apply to all users. The My VMware team is working daily to improve the system and polish off any rough edges. I’m also working closely with the My VMware team and will update this list as items are resolved or work arounds created. Here are some of the gotchas that I came across while working with the My VMware beta. Hopefully these will save you some time as you get used to the new portal. Missing Entitlements? Are you Looking at the Right Account? Users can be granted access to multiple accounts. When you log into the portal you may not see the licenses/contracts/orders that you are looking for. Check the “View Account” drop down in the upper right hand corner to ensure you are viewing the correct account. Only one account can be viewed/managed at a time. After you complete a task within the License Key area, make sure you check the “I want to” dropdown box. Once you complete a task, it appears to always default you back to “View License Keys”, not the task area you just completed. It can be a bit confusing if you’re trying to do a bunch of license key management (like a Super User organizing your license keys on the first day) because you keep getting pulled away from the area you were working in after each task completes. Make sure you select “Home” folder or a Sub-Folder in order to activate the “Create Folder” option. The portal is able to move only one folder at a time. While you can select multiple folder, there currently is no way to move multiple folders at one time. If you have a large number of folders in your Account as a result of the My VMware migration, it may be difficult to find new folders you created as part of implementing your organization system. One quick solution (that can easily be backed out in the future) is to name all your new folders starting with a – (dash). This will force those folders to be sorted at the top of your folder list. And, luckily, they will appear right below the folders that get automatically created when new orders are placed. After you clean up all the other folders, you can simply rename your organization folders to remove the preceding dash. One by one, grant a users access to all appropriate folders at one time. (There is no way to search for existing users like in the old License Portal, so you have to enter their name and email each time you grant them access to a folder. Thus give them access to all folders at once and then move on to the next user). Personally, I was confused by this the first time I did it. First select the user who has permission you want to copy, then choose “copy user permissions” option. In the pop-up window, select target users who will get those permissions. Note: This will copy all those users’ permissions for all the folders they have access to. There doesn’t seem to be a way to copy just permissions for one or two folders, so if you have a complex set of folders and users use this feature cautiously. When you click a SuperSet permission (it won’t deselect while the sub options are selected, you need to first deselect sub options and then you can deselect superset options. When you select a folder from the folder list, the license summary section updates to show you a total number of licenses for all the products contained in all selected folders. It will not automatically include licenses from subfolders. You have to specifically selected those subfolders to get them included in the summary. This is because both the parent folder and the sub folder could contain license keys. As of publishing, you can’t search license keys based on the “Notes” field. I now many clients use this field to help them organize their license keys in the old license portal by placing a business unit or group tag within the field. Since you can’t search the license keys based upon this field, organizing your keys may take a bit more time as you will have to expand each license key while organizing. If you use the notes field as part of your license key tracking or management, then you’ll have to edit the notes for newly generated licenses keys as a second step after you split the original key. The current system doesn’t allow you to add a note to a newly generated license key during the key splitting process. 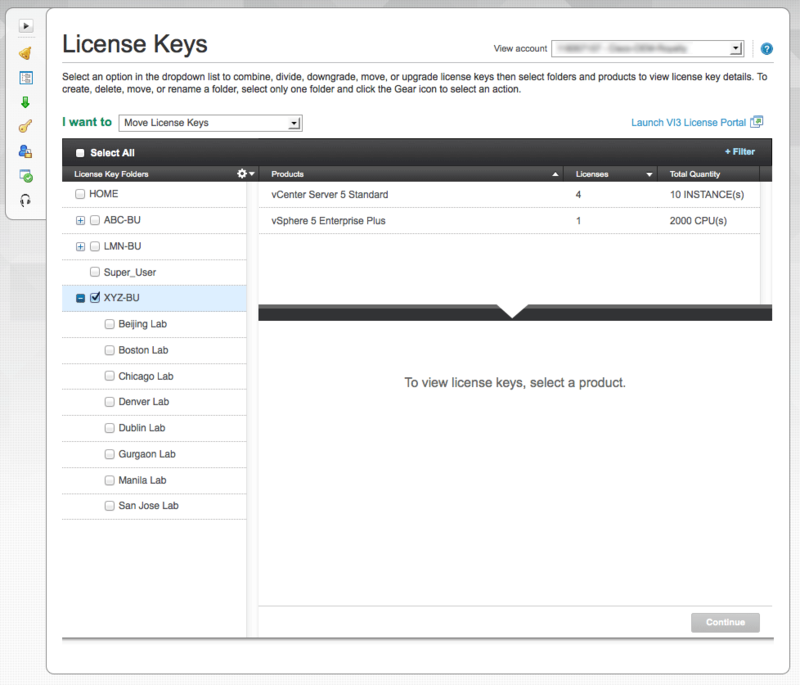 You can only move license keys from one product at a time within the portal. While you can select multiple license keys for the same product to be moved at once (i.e, vSphere 5), if you switch your view to another product (i.e., vCenter Server 5) you lose all your original selections. You’ll have to organize your vSphere keys and vCenter Server keys in two separate steps. For Super Users and the Procurement Contacts, please consider these two users interchangeably unless otherwise noted, the key items of note about My VMware is how to manage licnese keys and Orders/Contracts. The new portal has a number of features that provide more control to Super Users and Procurement Contacts regarding distributing license keys across their organization as well as keeping all those keys organized. I urge all Super Users to take some time to become familiar with My VMware and the new level of visibility they have to Accounts and Entitlements for their organizations. They should also keep in mind that changes they make to License Key organizations can have impact to other My VMware users within their organizations. As part of the My VMware launch, there was also a consolidation of account records within the VMware Orders/Contracts system. Over the years a single company may have had multiple people (say from different Business Units) buy licenses from VMware. Each order could have created a separate record in the VMware systems. My VMware worked to consolidate all these record under the Super User (with some exceptions for larger customers). As a result, the Super User will be able to see all orders, support contracts, license keys, and Support Requests within their organization. 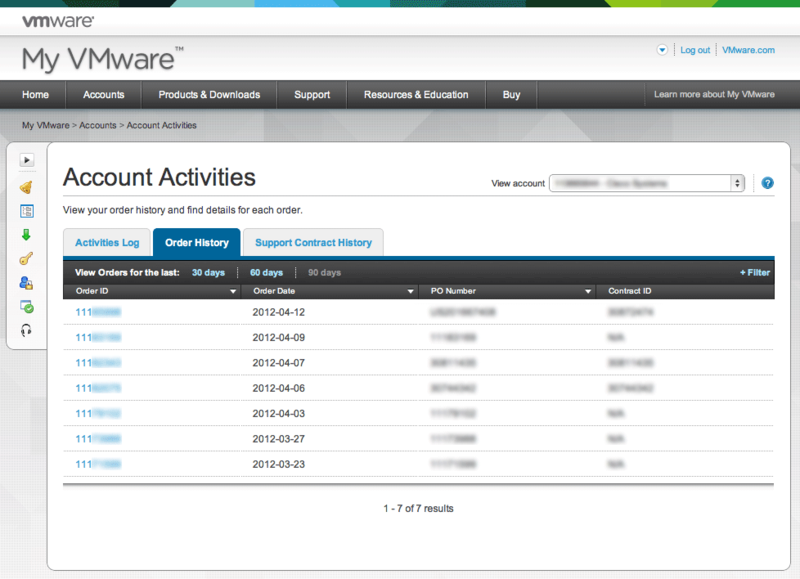 It is still possible that any user within My VMware would have access to multiple Accounts. Any user can switch between accounts by using the dropdown in the upper right hand corner of My VMware. The portal only allows you to work within one Account at a time. So if you don’t see something that you are expecting to be within your portal, check to make sure you are working within the correct Account. First, a quick note about ELAs: the ELA license keys are typically assigned to the Super User. One of the biggest advantages of My VMware is the increased control over ELA key distribution provided to the Super User. Prior ELA customer usually ended up with multiple people inside their organization with access to the full ELA key; under My VMware the Super user can divide ELA keys and give access to a subset of the ELA to those who need it, and just the number of licenses they need. The big change in My VMware is the ability to organize license keys into folders. Everyone has a default “Home” Folder and if you were a PLA or SLA in the old system, a folder with their full name in which all your license keys were deposited. Super Users will see in their named folder the keys for which they were PLA; they might also see folders with the names of other individuals in your company that were PLA for other orders.You will now have the ability to organize these keys in a way that makes sense for your organization. I can foresee this being broken down by Business Unit or Group Name and then possible further by physical location the licenses are deployed (see below screen shot with mocked up example). Some thought should be put into the organization of the License Keys by the Super User. The process of moving and granting permissions to license keys contains a number of steps…you won’t want to be redoing this once you start. See the My VMware Gotchas before starting. Super Users will want to communicate and coordinate across all the VMware users within their organization before doing major organization of keys within folders and granting access to these folders. If a Super User moves license keys around from folders with another User’s name or renames those folders those changes will instantly appear within those User’s accounts. This could be confusing with adequate communication as users will have see their folder names and permissions change between two logins.